The above photo was taken at the 2013 summer camp held at Camp Fawcett. The volunteer leaders felt it was important to reflect history with a rendition of the tent Mr. Finegan's grandfather camped in decades ago as then President of the council. John Keyes Finegan longtime area rancher and passionate Boy Scout leader passed away peacefully in Kerrville, Texas on June 2, 2016 with his family by his side. He was born in Del Rio, Texas on July 19, 1928 to Brancie Fawcett Finegan and Dan Finegan. He was preceded in death by his parents and his sister Elizabeth. He is survived by his wife of 66 years Betty Hodges Finegan, daughter Sharyn Goldman and husband Jeff, son Jim Finegan and wife Carol, Raymond and Ellen Quigg. Grandchildren Kara Woodson and Coulter Woodson. Also left to honor his memory are Jo Beth Fawcett, Robert and Sally Fawcett, Sara and David Winters, Bill Fawcett and Cynthia Putnam, George and Edwina Whitehead, Debbi Wier, Nancy and John Birkhimer, Clay and Rendy Davenport and Cindy Whitehead. There are also many nieces, nephews, cousins and friends. His loving caretakers Juana Navarro, Nancy Escobar and Elena Escalante. He attended Texas A & M University before he transferred to Sul Ross College where he was instrumental in the formation of the National Intercollegiate Rodeo Association. In July 2011 he and Betty were inducted into the Sul Ross Rodeo Hall of Fame. John and Betty married June 7, 1950. They moved to the family ranch on the Devil’s River where he had built her a home before their wedding. He was a lifetime rancher. In the early 1970’s John Keyes added exotic hunting to the ranching operations. He also added a campground and fishing. This new venture was the Dolan Creek Ranch which became well known and attracted clientele from around the world. Among his accomplishments were serving on the vestry of St. James Episcopal Church, Pilot, Scoutmaster of Troop 202 for ten years, a Rotarian, 4-H Club Livestock Contributor and Leader, Assistant Coach of the 4-H Rifle Team State Champions, Soil and Water Conservation Board Member and President of the Amistad Bass Club. John was also an accomplished sculptor and author. 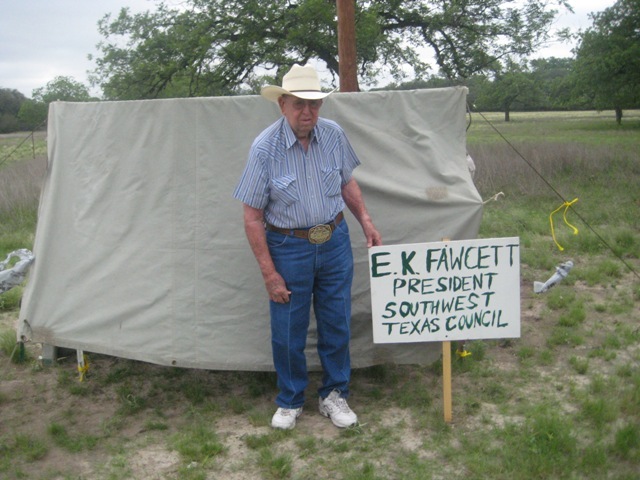 In his long and distinguished Scouting career John Keyes first attended Boy Scout Summer Camp with his grandfather, E. K. Fawcett, founder and namesake of Camp Fawcett on the Nueces River before John Keyes was old enough to join Scouting. He then attended Summer Camp as a youth member and again as an adult Scoutmaster of Troop 202 Del Rio, Texas. During his Scoutmaster years he provided adult support for his troop on may outing adventures including a 50 miles canoe trip down the Devils River, an international canoe trip to the Boundary Waters of Canada, various caving adventures in Southwest Texas and many weekend camp to his beloved Dolan Falls Ranch on Devils River. John Keyes was an active and faithful member of the Order of the Arrow, national honor camper society, and received its highest service award, the Vigil Honor. John Keyes also served for much of his adult life as a Trustee for Camp Fawcett. In 2014 after a lifelong career in volunteer scouting including service to his troop, his Amistad District and to the council including attending the first 20th Century Wood Badge Advanced Adult Training and serving on staff, John Keyes received the highest award for life service to Scouting, the Silver Beaver, an award also received by his grandfather, E. K. Fawcett. All of John Keyes “boys” will forever carry his memory, and cherish his loving influence and guidance on their lives. Services will be Saturday June 18, 2016, St. James Episcopal Church in Del Rio, Texas at 10:30. Burial will follow at the Westlawn Cemetery.